Kathryn Daugherty passed away on February 24 after a two-year battle with cancer. Her husband, James, plans to hold a memorial service this spring in Maui. They were married nearly 40 years. Kathryn’s life ended in the home in Henderson, Nevada that the couple had called their Dream House. When they started work on it in 2009 she set out to track every step on her blog Adventures in Surreal Estate: Building our Dream House in the Desert. Then illness took its toll and she stopped posting in September 2010. The house did get finished — she told Facebook friends on January 6 they had moved in. Unfortunately she did not have long to enjoy it. She was among the most respected sf convention runners, having done indispensible work as a department head and division manager at many Worldcons, as well as working Baycons, serving as the “beach chair” of the 2000 Westercon in Hawaii, and as San Francisco Science Fiction Conventions Secretary. Chris Garcia credits her invitation to participate in BayCon for his return to fandom in 2000. Did you actually carry around that mammoth publication in your pocket? Even my purse wasn’t big enough and somewhere in there is the map to the Lost Dutchman Mine and Judge Crater’s phone number. One day the woman said to her husband, “Look, there is going to be a convention in the city Right Next Door for people who love fantastic literature. Let’s go.” They went and discovered a new world to explore. The woman saw people singing. She had a good voice and thought, “Maybe I could do that too.” The woman saw people with beautiful costumes. She had a sewing machine and an impressive collection of cloth. She thought, “I could make a costume some day.” She saw artists and writers and scientists. “Maybe there is a place for me there,” she thought. But when she was asked to be a door guard for the masquerade, she knew she had found her calling. She got a ribbon to wear and got to hang out with the people who were actually running the convention. She began to travel to other conventions to volunteer. She began to plan other conventions. One day she was even the Chair of her very own convention. She was an engineer by profession. Her favorite job at the university had been feeding punchcards into the giant CDC 6400. Kathryn and her husband were genuine globetrotters. Over the years she and James visited a very long list of countries. For a time Kathryn even lived in New Zealand. She once told the SMOFs list that among the places she most liked to explore were Cambodia, Bali and Vietnam. Her blogs were filled with photos of international travel and accounts of cruises and tours. Most fans discover fandom through their love of the stories but when they become absorbed in its social aspects the reading tapers off. Not in Kathryn’s case. I found her current and complete familiarity with the latest works in the sf field one of the most impressive things about her. Some years she racked up reading 200 books. She was so knowledgeable and articulate fans loved to attend her one-woman convention programs to hear pointers about developing new writers and take notes on her award recommendations. Or sometimes she’d be the centerpiece of a panel: one of the best times I ever had was appearing with her and Chris Garcia to handicap the Hugo nominees at the 2008 Westercon. Her legion of friends, myself among them, will miss her strength, humor, and knowledge. Further Reading: Friends will also want to read Deidre Saoirse Moen’s appreciation of Kathryn. Tarpinian also heard Robinson was offered $100,000 for the lot before the auction started. The second of 12 lots is scheduled to be auctioned on March 9. Update 03/01/2012: Participants in the auction dispute the figure reported here, saying it was actually much higher. Well, if there had to be a mistake I’m glad the correction means Frank Robinson realized even more from the first lot auctioned from his collection. I will be watching for the results to be posted as promised by the official web page. Heart attack survivor Laura Haywood-Cory didn’t stop at boundaries of fandom in getting out the word about heart health (efforts covered here in “A Heartfelt Fanzine” and “A Second Change of Heart”). She and Katherine Leon approached and encouraged Mayo Clinic cardiologist Sharonne Hayes to study the rare heart condition called spontaneous coronary artery dissection (SCAD). Laura Haywood-Cory is a graduate of the WomenHeart Science and Leadership Symposium (a WomenHeart Champion) at the Mayo Clinic in Rochester, Minnesota. In 2009, she helped enroll women in the largest single-center study of patients who’ve suffered from spontaneous coronary artery dissection (SCAD) and heart attack. A devoted advocate for women with heart disease, Laura volunteers at health fairs and other events across the state [North Carolina] where she educates women about heart disease risks and prevention. She herself is a heart disease survivor, having suffered SCAD and a heart attack in 2009. She is active on the WomenHeart online support forum and has a blog, A Change of Heart, where she chronicles her post-heart attack life. Laura says tonight (February 28) NBC affiliates may broadcast a story she was interviewed for when in New York for the award presentation. So keep an eye out. It’s a face-lift when you give a building a new façade – is there also an idiom for tearing off that replacement to restore the original? Because that’s what’s happened at Clifton’s Cafeteria. 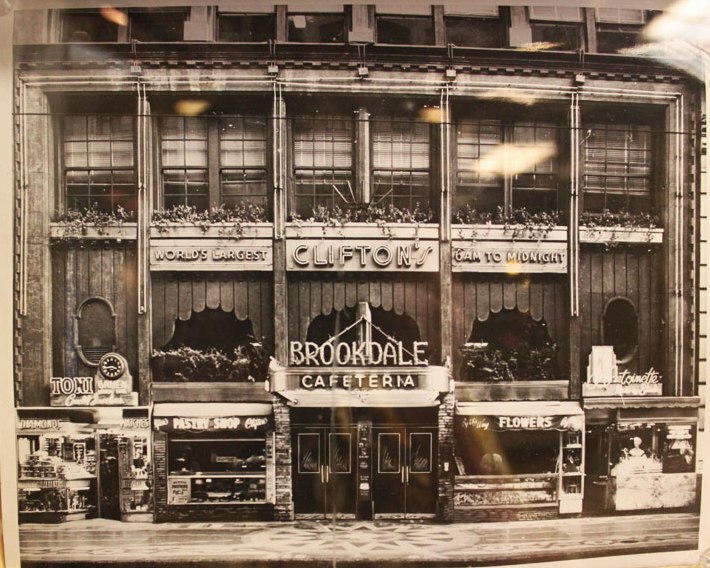 Clifton’s has been making fanhistory for over eight decades. In the late 1930s it hosted early meetings of the Los Angeles Science Fantasy Society in the Little Brown Room. Long-time members have had reunions there over the years, including one honoring the club’s 70th birthday (“LASFS Cuts the Birthday Cake”) that was covered on local TV news because it drew those teenaged fans who grew up to have stars in the Hollywood Walk of Fame, Ray Bradbury and Ray Harryhausen. Clifton’s has had the good fortune to be acquired by Andrew Meieran, famous for developing Edison’s night club from the old downtown power house. As part of his plan to revive the cafeteria’s architectural glory Meieran had builders peel away the grate-like aluminum covering that has concealed the building’s original 1904 façade for half a century, added at the time thinking it would give the place a modern appearance. Bob Reed, who conducted a fannish tour of Clifton’s for io9 and complained “The modern face ain’t as cool as the original” will be pleased. 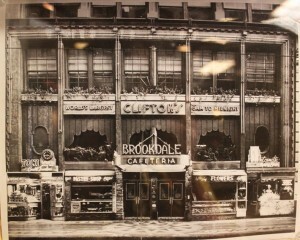 Clifton's Cafeteria with original facade. SF writer Mark Bourne passed away yesterday, quite suddenly and unexpectedly, of a “cardiac event.” Please see http://scarlettina.livejournal.com/ for information on the memorial services (there will be a funeral this week and a celebration-of-life event in the next month or two). Mark’s wife Elizabeth is asking that anyone who would like to honor him with a donation make their donations to Heifer International. If you have anecdotes about Mark, amusing things, things that really defined him and his humor and kindness for you, please leave them as a comment at http://scarlettina.livejournal.com/1007779.html. See also this post at Locus Online. But elsewhere [in New Orleans], alternative plans are being made — by “Star Wars” fans drinking beer out of a seven-foot-tall cardboard robot that conceals a keg. The Krewe attracted 400 marchers in 2011. Since then founders Ryan Ballard, Brett Powers and Kira Haubrich have managed its continued growth, which includes a proliferation of subgroups like the Space Cadets Marching Corps and the Krewe du Who. The group naturally has its own redshirt Security Forces, too. 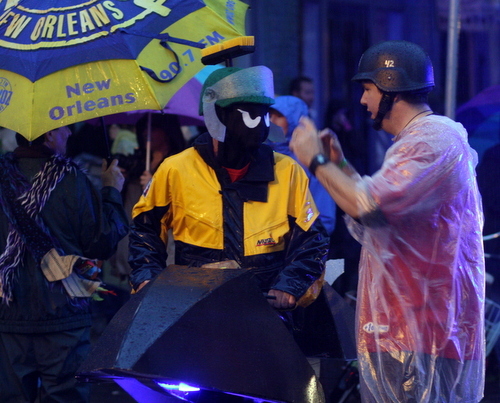 Chewbacchus featured an armada of hand-built science-fiction themed “floats” drawn by bicycle or by hand, as well as dozens of individual krewe members in detailed homemade costumes that were unfortunately hidden by plastic ponchos in the downpour. After a late start in hopes that the rain would clear, the parade took an abbreviated route from its starting point on Clio, around to St. Charles, down Felicity and down Camp to the Howlin Wolf for the Chewbacchanal ball. Along the way, spectators were greeted with an outburst of generosity and gratitude for braving the weather to watch the parade. Why do I need a Droid Collar? The Droid Collar (aka wrist band) allows you to march in the parade AND it is your ticket for the Chewbacchanal. It also admits you into reserved Krewe areas and gives you access to Krewe ONLY FREE beer and FREE food/snacks. What happens if I don’t get a Droid Collar or lose it? You are completely fucked and we will keep your money and drink your beer and we will sacrifice you to the Mayan Space Gods. You will not be allowed to parade with us or permitted to enter the Chewbacchanal without a wristband. By Taral Wayne: Yesterday I bought a potboiler at the Sally Ann for a mere $.49 — Sherlock Holmes and the Treasure Train, by Frank Thomas. While reading, I jotted down a few things I wanted to look up later. We all know that the Great Detective was an admirer of Sarasate’s violin performances… but who the heck was Sarasate? For that matter, was there really such a person? It seems there was. Pablo de Sarasate was one of those child prodigies who could play an instrument or compose music at an age when most of us find it challenging to eat pabulum without getting it all over ourselves. I think his reputation must have faded over the decades. The Spanish violinist only made a few recordings in 1904 — four years before his death — leaving little behind for posterity to judge. On a whim I went into edit mode and added to the cultural references that Sarasate is mentioned in the Frank Thomas novel. I decided to see if Frank Thomas had an entry in Wikipedia also, and link him to Sarasate. He was and I did. But guess who Frank Thomas turned out to be? Not only was he the author of several other Holmes pastiches, he was a very minor film and Broadway actor. In 1950, he was given a television role that nearly knocked my socks off – beating Jack Lemmon for the part, Frankie Thomas played Commander Tom Corbett on early TV! His was the only one out of a handful of TV skiffy for kids that appeared on all four networks. Another thing we all know is that Tom Corbett, Space Cadet was based loosely on Robert Heinlein’s novel. Thomas must have been a big fan of Heinlein. When he died in 2006, Frank M. Thomas Jr. was buried by his request in his Space Cadet uniform. Chicon 7 is reserving ad space in the 2012 Worldcon’s Souvenir Book. The deadline is June 15, 2012. The Worldcon Souvenir Book is distributed to attendees or mailed to members who do not attend. The publication features information on Worldcon history, the Guests of Honor, the host city, and the membership list, as well as a range of feature articles covering different aspects of science fiction. Chicon 7 is offering full-, half-, and quarter-page advertising space. Professional rates start at $300 for a quarter-page black-and-white ad and range up to $1,400 for a full page in color. Fan rates start at just $75 for a quarter-page in black and white and range up to $500 for a full page in color. Special rates apply for the inside front and back covers (color only). All advertising space must be reserved by June 15, 2012, with artwork due by the same date. Full details can be found on the convention website at www.chicon.org/pubs.php. For more information, write to the Souvenir Book advertising sales team at adsales@chicon.org.